Hey guys! I just want to take a minute and say I've really been enjoying all your comments lately. They seem to have grown in number over the last few weeks, and I find that to be awesome! The topic of this post deals with my religion, so if you find that offensive, please stop reading now. So, as I really hope you know, I'm a Christian. This means that I confess I'm a sinner and cannot be in the presence of God on my own. I submit to the Word of the Bible. I believe that Jesus Christ walked on earth, died, and rose again after 3 days, and that it is only by His grace that I could enter heaven. If you have questions about any of this I would suggest reading John, Acts, and Romans, three books in the New Testament of the Bible, or emailing me at sarah.y.faulkner(at)gmail.com. 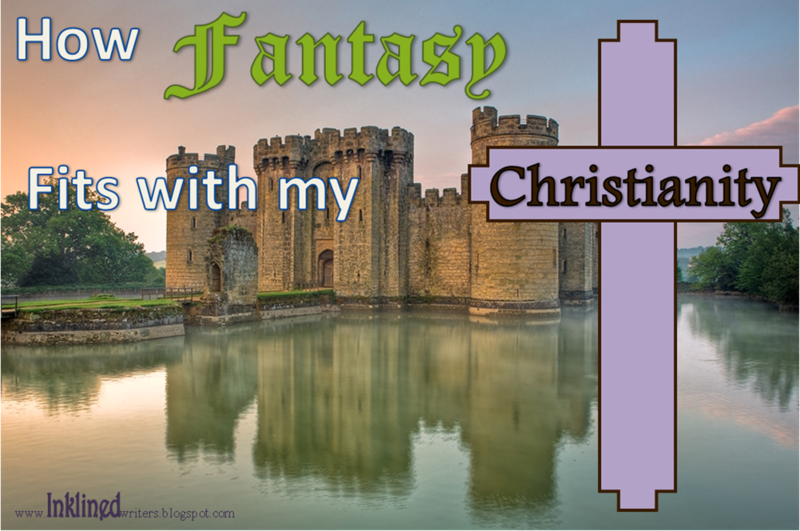 As you also probably know, I love fantasy. I love to read it, write it, and lately watch it in the form of Merlin on Netflix. Magic has always been a kind of romantic idea to me. I mean, come on. Even when we're little kids we're read stories about fairy godmothers, sleeping curses, and dragons. How could we not fall in love with magic? But the Bible has some pretty harsh things to say about magic, and for that reason fantasy books such as Harry Potter are often taboo in Christian circles. Some families are fine if their kids read it, some aren't. I have done my fair share of thought when it comes to fantasy and magic in general, and this post is what I've come up with. "Do not turn to mediums or necromancers; do not seek them out, and so make yourselves unclean by them: I am the Lord your God." "There shall not be found among you anyone who burns his son or his daughter as an offering, anyone who practices divination or tells fortunes or interprets omens, or a sorcerer or a charmer or a medium or a necromancer or one who inquires of the dead, for whoever does these things is an abomination to the Lord. And because of these abominations the Lord your God is driving them out before you." "Now the works of the flesh are evident: sexual immorality, impurity, sensuality, idolatry, sorcery, enmity, strife, jealousy, fits of anger, rivalries, dissensions, divisions, envy, drunkenness, orgies, and things like these. I warn you, as I warned you before, that those who do such things will not inherit the kingdom of God. But the fruit of the Spirit is love, joy, peace, patience, kindness, goodness, faithfulness, gentleness, self-control; against such things there is no law." And here's what I have to say about those verses in regards to fiction. In the Bible, Jesus, the son of God but also fully man turns water into wine. He also feeds a crowd of 5,000 with 5 loaves of bread and 2 fish and then fills 12 baskets with the left overs. We know that Jesus didn't sin, therefore the problem with magic isn't breaking the laws of physics. As far as I know, the Bible never says we're the only intelligent life he created. In fact, we know we're not because God also created angels. So yes, on earth the supernatural only happens in two ways. 1) The power is given from God and 2) the power is given from Satan. In Narnia (a series by C.S. Lewis) the magic works this way too. The good power comes from that world's Jesus, Alsan. It isn't spelled out as to where the bad magic comes from, but we get the idea that it's not good. And I'd have a hard time with someone who came to me and told me the Narnia books are sinful. I feel like those books really glorify God. (If you have a problem with this, again, email me.) If you have a world were elves, dwarfs, and dragons exists, who are we to say that what would be supernatural in this world couldn't happen there. Here's the thing about fiction. It is not an actual representation of reality. Some things are different. There are a lot less bathroom breaks in fiction, for one, and also real life doesn't have cliff hanger chapter endings. In my fantasy novels, magic is not given by God or Satan. It is a natural talent that comes with it's own set of rules and restrictions. It isn't inherently good or evil, but can be used either way, depending on who's using it. That's just the way things work in this fictitious world, and that's the way I think of magic working in other books I read too. For instance, we all know that there is no hidden Hogwarts School of Witchcraft and Wizardry. It is a made up part of the story. So are the characters. And so is the magic. Do you have questions about this post? Feel the same way? Feel differently? Did I change your mind or make you think about something you never had before? Please leave a comment and tell me. Or, if you want, write up a blog post in response. I love reading all the response blog posts that you guys write! It makes my week. I know this can be a touchy subject, so please remember to be gracious to each other in the comments. The reason I wrote this post was to express my views and start a conversation, not and argument. what's your opinion on magic/fantasy stuff? Thank you for this post! I feel the same way. In a few of my stories, their world has lots of gods and goddesses, like Greek mythology. But, like my mom says, who knows, they could be real in that world! Because it's not this world! When the scriptures talk about sorcery, I think it means using Satan's power. And we definitely don't want anything to do with that! If anyone doesn't like anything I said, please don't argue. I'm far too good at it. :) I'm glad you like the post, though I would like to say that I believe that God is still God in other worlds, it's just that he might manifest himself differently. I really loved this post, Sarah. This is something that's been tugging at my mind a lot. My parents don't really want me reading the Harry Potter. And I'm fine with that, but the subject of wizardry and sorcery has had me wondering. Yes, it's been tugging at my mind a lot too, hence the post. I have several friends that aren't allowed to read Harry Potter. In the end, you should obviously honor your parents, even if you disagree with them. Hoped this post helped you and I'm glad it came at a good time for you! Great post! Especially good point about different worlds have different rules. That being said, I have no big problem with fantasy magic. I write it, read it, and watch it. As long as it's not saying the "good guys" magic coming from something evil, I'm okay with it. I know what you're saying about Merlin characters. I'm half way through the 4th season and I have a feeling the worst is yet to come. I really liked this post. The last couple of years have been kind of a circle war going on in my house about magic. I've been allowed to watch the Harry Potter, Narnia movies, etc. and I've always read quite a bit of fantasy, as long as it wasn't blatantly satanic. But then those Bible verses you just quoted were brought to my parent's attention and a huge debate broke out. I tend to feel the same way as you do. I know that it is fictional, and something make believe isn't going to sway my faith. As long as it isn't specifically Satan glorifying, I don't see any problem with reading or writing it. My parents have kind of relented, but it's still a touchy subject for us. I'm glad this post helped you! I'm really thankful my parents aren't super strict when it came to my reading choices. There were a few things I read that I shouldn't have when I started reading YA, but for the most part it's nice to be able to read whatever I happen to pick up, even if I don't agree with it. Excellent post! I agree with you completely, especially on point three. Fiction isn't reality. Question: what do you think about things like Percy Jackson? Since it isn't real it doesn't bother me, but I could understand if someone didn't like it because of all the Greek gods. I have a hard time with the Percy Jackson books. In the first book, Riordan says something about how the gods don't negate the existence of of God. But I wish he'd stressed more that the gods are more like mightier life forms (like the Asgardians) than actual gods. I don't think I could ever write a book like Percy Jackson, but I did enjoy reading them. Hi! I just stumbled upon your blog :) This post was really thought-provoking, and very well-timed for me. This is a subject I've been thinking about a lot recently. Fantasy is one of my favorite genres to read and watch. I love how imaginative and beautiful the stories are, and how they can show us a different way of looking at our own world. The Chronicles of Narnia, the Lord of the Rings, Percy Jackson, and the Merlin tv show are some of my favorite fantasy stories! My parents are okay with most fantasy, but they decided early on that we kids weren't going to read or watch the Harry Potter books/films. I never had a problem with that, because there were a lot of other books for me to read. But now that I'm older, I'm interested in reading them for myself to see where I stand on the subject. I will probably wait until I'm older and out of the house before I read them (just because I don't want to upset my parents or cause family tension, hehe!). I like the point you made at the end: Fantasy is good as long as it's glorifying Satan or putting evil in a positive light. I'm so glad I found this blog of yours, and I'm looking forward to reading more posts! Also, I'd like to ask a question...can you give me an example of one fantasy book/series that you think fits into the sort of fantasy that should *not* be read? I have some friends that aren't allowed to read Harry Potter right now but plan on it when they're out of the house. It is such a well loved book and has had such an impact on our generation, that I think at least the first book bears reading. As for books I don't recommend, the Bartimaeus Trilogy by Jonathan Stroud, Cassandra Clare's work, and the Fallen series by Lauren Kate are all books that are based loosely off of scriptures, but don't have strict Christian doctrine. That being said, I have read and enjoyed parts of those books. I can't really think of books that I've finished that blatantly encourage satanic worship. Thanks for commenting! I'm so glad you like my blog. How did you find it? Woah! I didn't realize how long that was...I'm so sorry! This is a great post, Sarah! While I come from a Christian family as well, my parents were never strict about the "no magic" rule, and I grew up reading Harry Potter and other fantasy books. I'm so glad I read these. Like any other book, fantasy novels can change your perspective on life and help you through tough situations. Also, reading about different worlds is a great opportunity to escape from reality. I don't think it's a sin to read (and watch) things with magic. I only think it's a sin if you actually participate in sorcery and try to summon Satan. I'm glad you liked the post! I love the Harry Potter books and I'm glad my parents let me read them, although I did have to wait until I was 13. I think most if not all of the big deal about Harry Potter was made up by people who hadn't even read the books. I think it's pretty much the same thing as Percy Jackson. It's not real life, and they're not /real/ gods or /real/ witches and wizards as we would think they were in real life. It might have been better if J. K. Rolling had called them something other than witches and wizards. I think that's the main reason why Christians pounced on it. Though... because my parents had heard about it in such a negative light, I haven't been able to read them and it wasn't that big a deal for me till the past few years. Now I really want to read them, but now I have to wait, and slowly show my parents, with patience, that it's not wrong. I'm really glad I stumbled across this post. My favourite genre is fantasy and I've recently noticed that some adults seem to have a problem with that. I feel like as long as you realize that it is fiction, and often entirely different worlds with different, fictional rules, it isn't a problem. Also, many things written as magic in some books are very similar to the miracles performed by Jesus (and others) in the bible. Thank you so much for writing this post. It's nice to know other people are thinking about the same things. To me, fantasy books tend to be some of the most moralistic. They're about good versus evil and dark versus light, things that are very true in reality. They're lessons taught in parables, which is how Jesus taught. If the magic within them bothers someone, they're probably taking it too literally. Oil and Water, Do I Mix?